Newly remodeled! 2 bedrooms - The renovated carriage house is a duplex with open living-dining-kitchen area and separate conservatory-sunroom on the first level and two bedrooms(queen, twins) and bath on the second floor, and is an integral and space of the Townsend building. There is a deck above the sunroom and another deck on the ground floor. By opening a connecting door, the carriage house unifies the entire home. The living space in the old carriage house of the Townsend Home is 1490 Square Feet. The total footage of the Townsend Home is 3667 Square Feet. 3 bedroom - The Sylvan is the newest addition to the Moorings, set back in a wooded area it is brand new construction with an open layout, 3 bedrooms plus a sleeping loft, dramatic stone fireplace and large deck with harbor views. 1 bedroom - The attached carriage house in the Brackett has been remodeled with living-dining-kitchen and bath on the first level and large bedroom (king) on the lower level. Both floors have private decks overlooking the ocean and harbor. 2 bedroom - The Brackett has been restored to its former historical uniqueness. It to has exceptional views of the harbor and all of the Moorings. 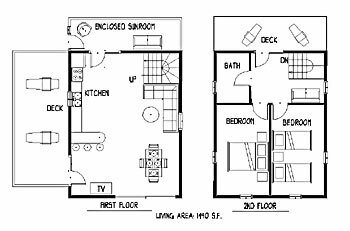 It has a large living-dining-kitchen area, gas fireplace, two bedrooms (one full, one king), and bath. 3 bedroom - A renovated 1924 Bungalow, The Gatehouse includes a living and dining area with new bamboo flooring throughout, kitchen with stainless steel appliances (including a dishwasher), large master bedroom with king bed and sitting area downstairs, 2 single bedrooms upstairs, glass-tiled bathroom with separate tub and shower, expansive decks with harbor views. 2 bedrooms - With the addition of a new deck, this penthouse apartment has breath taking views of the harbor and out Islands including Monhegan. The top level of this home has a living room, huge deck, eat-in kitchen, gas fireplace, two bedrooms (one double, one king), and bath with shower. Newly remodeled! 2 bedrooms - The renovated carriage house is a duplex with open living-dining-kitchen area and separate conservatory-sunroom on the first level and two bedrooms(queen, twins) and bath on the second floor, and is an integral and space of the Townsend building. There is also a pull-out couch on the first floor. 1 bedroom - Newly remodeled and beautiful! This is a spacious one bedroom apartment and also accessible. This floor has a large living room, gorgeeous new eat-in kitchen, one bedroom (queen), bath with shower and deck, and is main living of the Townsend home. 2 bedroom - This is a spacious duplex top floor apartment in a classic Colonial home with wonderful views of the harbor. The top floor deck gives this building the most dramatic, panoramic views of the harbor. A living-dining-kitchen area is on the top floor, the two bedrooms (one queen, one double) and large bath on the second . 1 bedroom - The Poolside has decks facing north, south, east and west with views of the harbor. Living-dining-kitchen area and bath are on the first level. The bedroom (queen) has a 4-seasons addition which enables owner to lie in bed and watch the stars and the waterfall effect of rain. Copyright 2018 The Moorings of New Harbor Maine.